I have made fried rice in the past, because I wanted to add a second dish to the menu instead of a side of brown rice. I’ve tossed the rice with some sauteed veggies and a few of my pre-developed easy sauce combinations (such as the one in my Thai Rice Noodles, Thai Basil Eggplant, or Tofu Veggie Stir-Fry); and although these various versions of fried rice tasted great, I never really felt that I had developed a superb and unique FRIED RICE recipe until now. With this recipe, fried rice can take the spotlight. 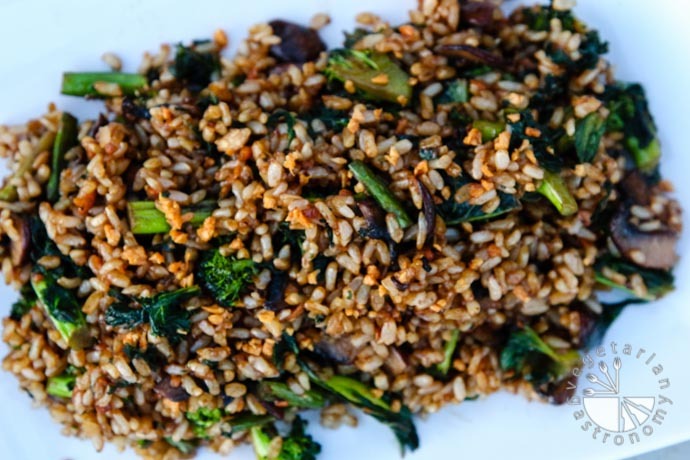 This Crispy Garlic Fried Brown Rice with Kale dish is delicious and has unique flavors. I’ve always loved the crispy texture and flavor of fried garlic in rice dishes at restaurants, and so I decided to incorporate it into this dish. The method of using fried garlic in my recipe was inspired by Serious Eats. 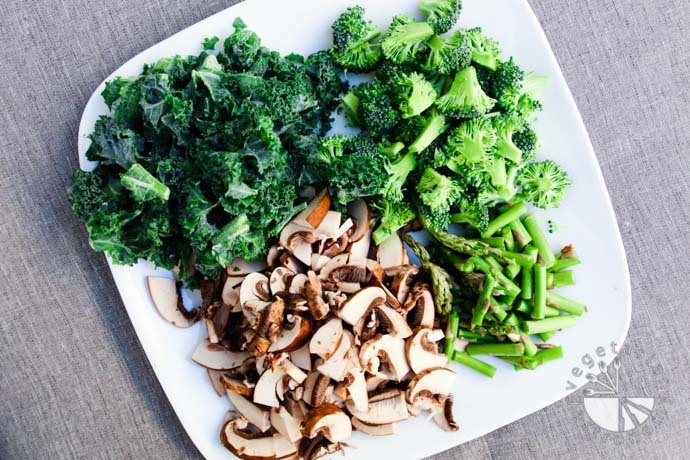 I added some of my favorite veggies to the dish – Kale, Broccoli, Onions, Mushrooms, Bok Choy, and Asparagus. As always, I wanted to keep the sauce simple, but tasty. I included a small amount of dark soy sauce to give this dish a unique full-bodied flavor. Dark soy sauce is aged for a longer period and is thicker and darker in color (hence the dark color of the dish) compared to light soy sauce. It tastes little less salty and like it has been caramelized, with a slight bittersweet flavor. It was the perfect addition to the dish. I haven’t been able to find a gluten-free dark soy sauce, so for a gluten-free version of this dish, simply add some molasses or dark brown sugar to a gluten-free tamari soy sauce (such as San-J) to thicken and sweeten it. 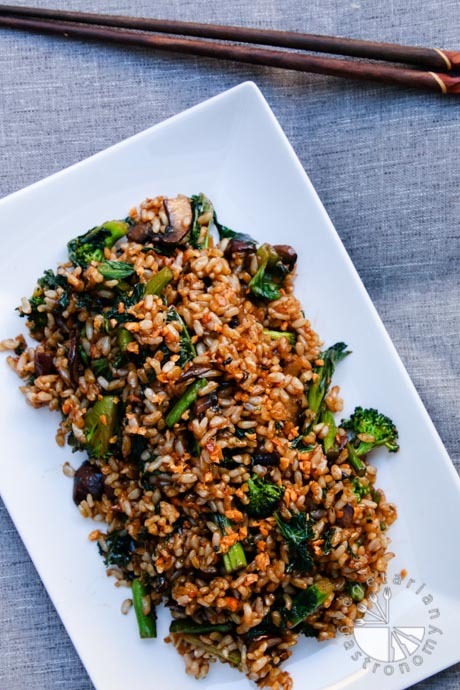 My favorite vegetables and brown rice cooked in garlic oil, combined and topped with loads of crispy fried garlic and a few drops of Sriracha makes for an excellent dish for the whole family! Don’t forget to enter my Giveaway of $110 gift basket worth of gluten-free, eggless Glutino Food products! For details on how to enter, go straight to this post or click here to enter through Facebook. The giveaway ends Sunday July 27th, 2014 at midnight! 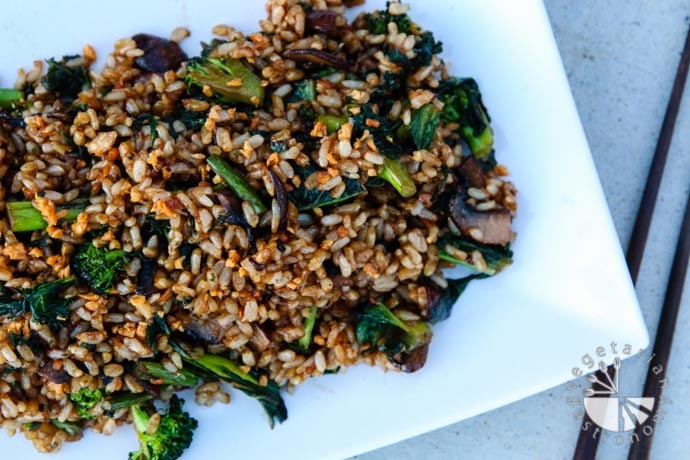 This Kale Fried Rice is for all you garlic lovers out there! 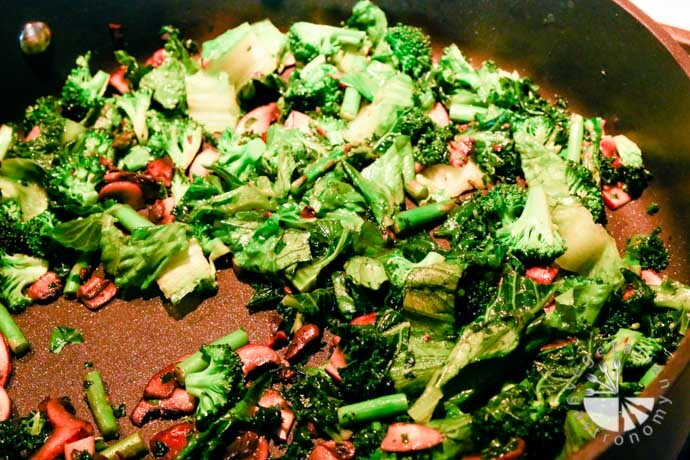 Crispy garlic, garlic oil, an easy sauce, and greens! Cut the asparagus spheres in ~2-in sections. Cut the broccoli into medium florets. Thinly slice the mushrooms. Slice and discard the bottom inch of the bok choy. Wash the remaining parts and chop the larger pieces in half. For the kale, be sure to leave medium size pieces. Set aside 2 teaspoons of the chopped garlic. 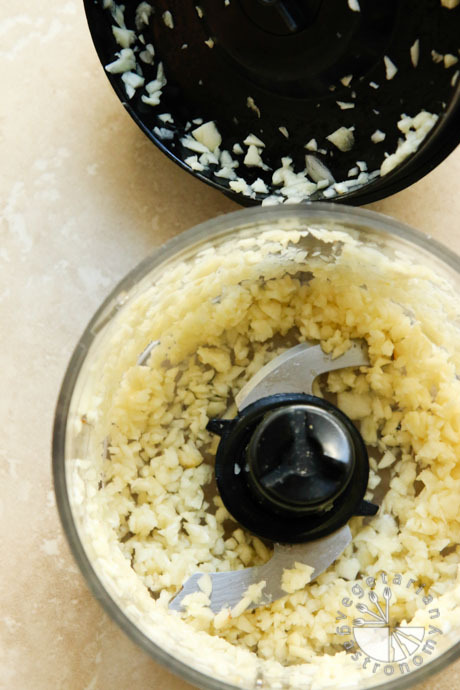 Toss the remaining garlic with a pinch of salt in a small bowl. Heat ¼ cup cooking oil in a small pot on medium-low heat. Add the garlic/salt mixture in the bowl to the oil and slowly fry until slightly browned and crispy. The garlic should maintain a gentle bubble while cooking. If this does not happen, reduce the heat. 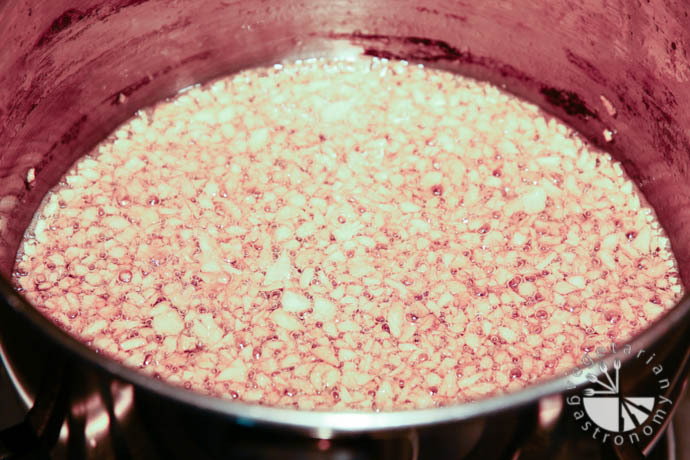 Once the garlic is golden brown in color and crispy, drain immediately, reserving the garlic oil for later use. 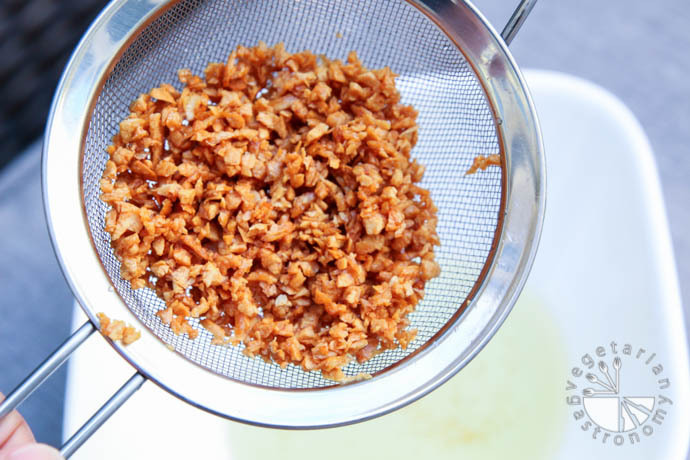 Transfer the fried garlic to a paper lined plate to cool. Heat 1 tbsp of the reserved garlic oil in a large wok or non-stick pan over medium-high heat. 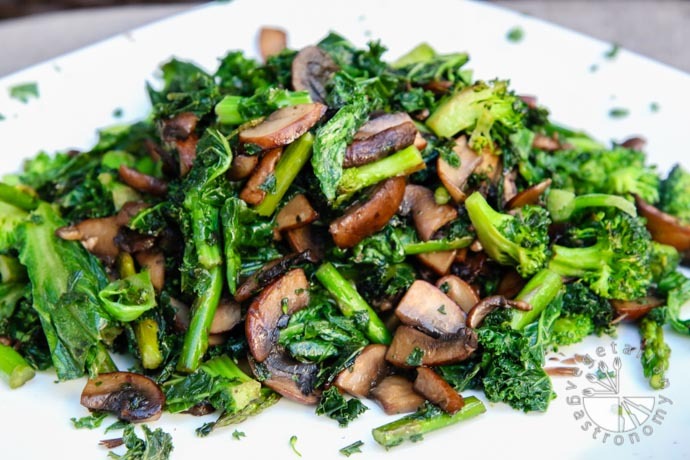 Add the asparagus spheres, mushrooms, and broccoli and toss to combine. Season with salt and stir-fry until all the vegetables are cooked and tender, yet still remain slightly crispy. A few minutes before the vegetables are done cooking, add the baby bok choy and kale. Stir-fry for 2-3 more minutes. Note that all of the water released from cooking the mushrooms should burn off during this process. Transfer prepared vegetables to a bowl and set aside. In the same wok, heat another 1 ½ tbsp of the reserved garlic oil. Add the 2 teasp chopped garlic (set aside from before) and fry for a few seconds until fragrant. 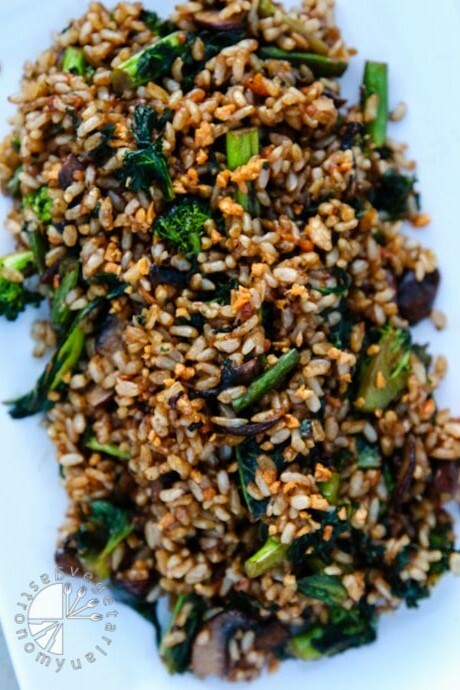 Add the cooked brown rice and mix into the oil and garlic, breaking up any rice clumps. Feel free to add extra oil if necessary to prevent sticking. Add all the stir-fried vegetables and toss with the rice. Add the soy sauce, dark soy sauce (or gluten-free alternative - see notes below), sugar, and chili sauce. Toss again until combined. If using, add a few drops of Sriracha Sauce and combine well. Turn off the heat, sprinkle in the cooled fried garlic, toss once more, and serve hot! Gluten-Free - Dark Soy Sauce Brands are not typically gluten-free. To replicate dark soy sauce, add some molasses or dark brown sugar to a gluten-free tamari soy sauce (such as San-J) to thicken and sweeten it if needed. Kid/Toddler Version - Omit chili sauce and/or sriracha for no spice. Can't wait to hear how you like this dish! I made this and your red curry tonight. By far one of the best fried rice dish I've had and the fried garlic was a DELICIOUS touch!!! Kunal liked it so much that he wouldn't have seconds because he wanted to save the rest for tomorrow! :) Thanks for sharing. I smiled and laughed out-loud while reading your comment...that is awesome! I love the idea of rationing out food to savor every bit haha. I personally have never been huge on fried rice at restaurants, so I don't have much to compare to because I don't typically order it, but this is one of my favorites. So it's great to hear from you guys that you both liked it as well! Thank you for trying it out and the comment!! Just made this with cauliflower in place of broccoli (and no sugar) and it was fantastic! Great, healthy, easy recipe! Thank you! So glad you liked the recipe Deb! 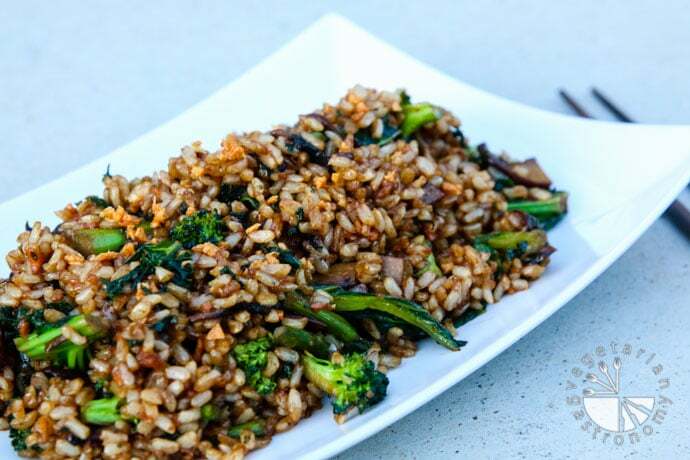 I'm a HUGE garlic fan so it's one of my favorite fried rice recipes. Thank you so much for trying it out and following! 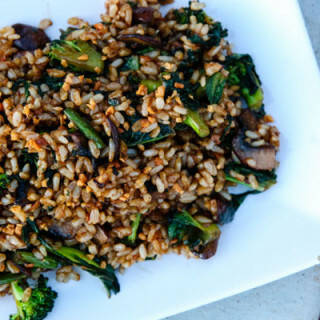 We love brown rice..with garlic and all veg. It was good. I made sweet and sour tofu too. Good dinner.